Working behind L blocks with small viewing windows is very cumbersome and can potentially lead to tilting of body or face leading to additional dose while working with radioisotopes. 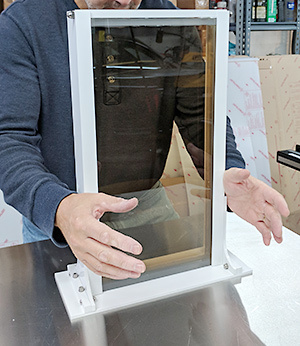 Large viewing windows provide protection while performing quality control handling, testing, sampling and transferring radioisotopes with a large viewing window. Ideal for radiopharmaceuticals, nuclear medicine, etc. 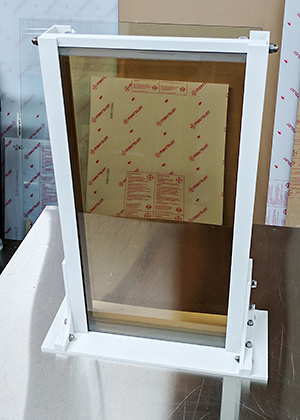 The ClearView table top shields provide a large viewing window for such applications. The frame of table top with a work platform is constructed of aluminum. 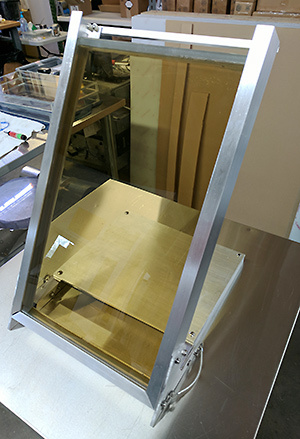 A ClearView Radiation Shielding panel is mounted on this frame and will have a support structure to lean the panel forward at a 60° angle. The support structure will be design for minimal obstruction from the sides of the panel but with the required strength to hold the panel at 60° on a flat surface. 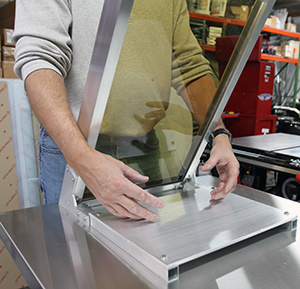 The housing container for the ClearView solution with be fabricated out of impact resistant clear polycarbonate. The table top shields are available with and without a work platform. The dimensions and thicknesses of the table tops can be altered to fit a smaller or larger easily. Additional shielding can be added to the sides of work platforms to provide a 360o protection. Standard Dimensions – 12’’x12’’, 24’x 12’’, 18’’ x 12’’, 24’’x 24’’, 30’’ x 24’’, 36’’x 30’’.